President Trump came into office promising to bring about an American coal renaissance by rolling back Obama-era environmental regulations. After one year in office, how did he do? In this note, we take stock of coal market developments in 2017 and find that while US production did recover slightly, it had nothing to do with a change in federal policy. 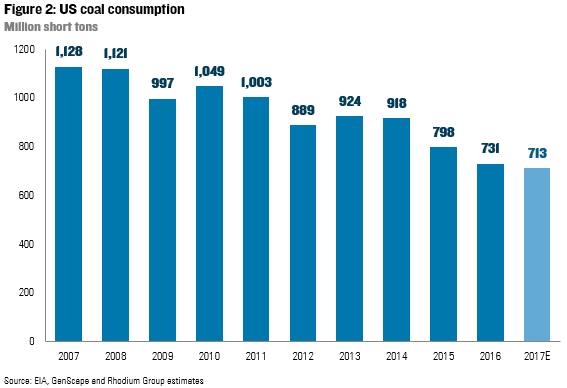 In fact, according to new Rhodium Group estimates, domestic coal consumption continued to decline last year. The growth in US output was due entirely to higher export demand and slower inventory draws. The past decade has been one of the toughest for the US coal industry since the first commercial coal mine opened in 1748 in Richmond, Virginia. Between 2006 and 2016, US coal consumption declined by 34% and production fell by 37%. Coal mining employment, which was already on a century-long decline due to mechanization, fell to just 75,000 people in 2016. Based on weekly data released today by the Energy Information Administration (EIA), US coal production increased by a little over 6% year-on-year in 2017. We don’t have full-year jobs data yet, but during the first three quarters of the year, US coal mining employment was up 0.5% year-on-year. While still far below recent levels (Figure 1), the bleeding appears to have stopped in 2017. Is the change in US federal policy responsible? In a report last April from the Center on Global Energy Policy at Columbia University, we noted that the majority of the recent decline in US coal consumption and production was due to market-driven energy market changes in the US and weak demand abroad. 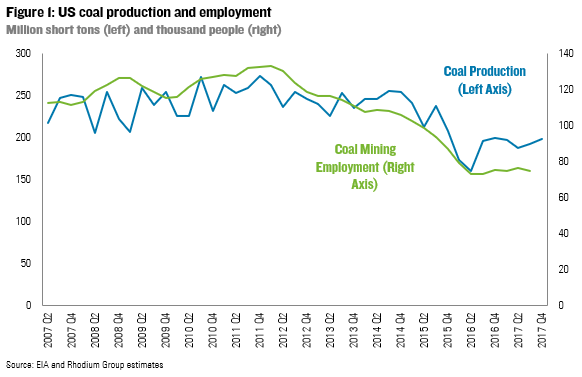 As a result, we argued that a change in federal policy could slow the future pace of the US coal industry’s decline, but that a fulsome recovery was pretty hard to imagine. We are now in a position to estimate full-year 2017 US coal demand, combining monthly data from the EIA through October and daily generator-level data from GenScape for November and December. US coal consumption declined by 2.4% in 2017 (Figure 2), falling to its lowest level since 1982. Demand was running above 2016 levels in the first half of the year due to higher natural gas prices (47% above H1 2016 levels), but plummeted during the third and fourth quarters, falling 9% and 7% year-on-year respectively. In the second half of 2017 natural gas prices were in line with H2 2016 levels, but there were fewer coal generating units due to recent retirements. If production was up and demand was down in 2017, where did the extra coal go? The primary explanation for the gap is growth in US coal exports. 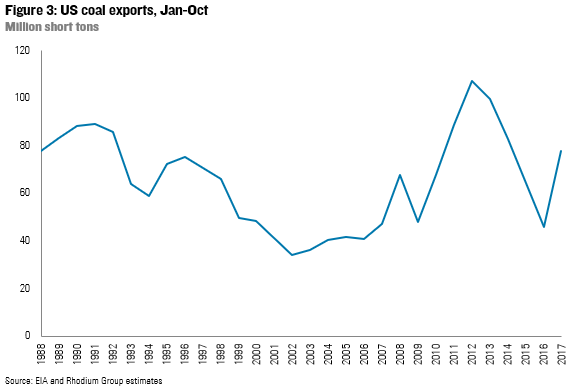 A recovery in Asian coal demand, particularly for steel making, combined with supply cuts in China and Australia boosted global seaborne coal prices (as flagged in our CGEP report last April). This made US exports more economically viable, increasing Jan-Oct volumes 70% from the same period in 2016 (Figure 3). The other factor was a significant slowdown in coal inventory draws. In 2016, stockpiles held at mines, power plants and industrial facilities fell by 41 million tons. The decline in 2017 was roughly half that.